Crescent Purchasing Limited is a registered charity and we continually invest back into the education sector. One way we have done this is through our Procurement Apprentice scheme. We introduced the scheme in 2017 and made an initial investment in the region of £300,000 which has supported 15 apprentices to work towards a Level 3 Business Administration NVQ whilst working within a procurement role within a Further Education College. Jordan Robbins was in the first cohort of CPC apprentices and over a period of 18 months Jordan has successfully completed his Level 3 Apprenticeship at Blackpool Sixth Form College. We caught up with Jordan to learn about his journey and to gain an insight into his experience and development over the course of his apprenticeship. How did you find out about the CPC apprenticeship scheme? The role I originally applied for with the college was a separate apprenticeship altogether and when I was interviewed for that position that was when the college informed me of the CPC procurement apprenticeship. After having some conversations and a separate interview for that, they offered the position and I accepted. Why did you choose to take the apprenticeship learning route? After finishing high school and another two years of sixth form I wasn’t wanting to commit myself to another four years of complete studying. I wanted to try something that was different for me and an apprenticeship did offer that because I would be able to gain some experience in the work place and study for a qualification alongside that. How would you describe your experience as a CPC apprentice? The whole experience has been fantastic, there has always been opportunities to grow and develop and the most important thing for me is that I felt supported. What was the best part of the experience and why? The best part was seeing my development over the course of the apprenticeship because I started off not really knowing anything about procurement and slowly I became involved in learning about procurement and being involved in certain processes where a requirement was identified. I feel that my professional development was the best part of my experience. What were the most challenging parts of your apprenticeship and why? The most challenging part for me was the first couple of months that I was in the role because I had no prior experience in procurement. There was a lot of terminology and processes that I didn’t really understand but I received support and I even had Linda Carney (a CPC Regional Procurement Advisor) come and visit me while I was working to explain different things to me about procurement so I think with that support I’ve really felt my confidence and knowledge grow. How did you find the balance of taught learning and on the job learning? With my course 20% of my working week was allocated to completing assignments and qualifications and then the other 80% would be on the job learning. I did find this fairly straight forward to manage as I had my calendars and I could move things around depending on which times were convenient to complete assignments. The part I most enjoyed was on the job learning because I think I learn best by just doing things and getting some experience, so I did find it a good balance. What was the most interesting thing you learnt? The most interesting thing I learnt would be the benefits of procurement for products and services and why it’s worthwhile for buyers and suppliers. Like I said with no previous experience I didn’t really understand it so I did find it really interesting to find out why it is so beneficial to organisations. My apprenticeship is finishing in February and I’m going to be stepping away from procurement as I’ve got a new role with Blackpool Council, I’ll be joining them as a Level 4 IT Assistant Apprentice. What learning will you take to your new role? The biggest thing I will take with me will be to always be confident in my own abilities and to contribute if I think that I’ve got an idea that can help the team. The other things I will take with me are the skills I’ve picked up which is everything from communication to teamworking, they’re things I will always be able to use in any future career, it’s been great. Why did you decide to move away from procurement? I don’t really think I’ve experienced anything negative that has influenced my decision to do that. The work I’ve done I’ve enjoyed in procurement and now that I’ve got the experience and completed the apprenticeship I feel like I just want to try something new. I’ve always had a keen interest in IT in my personal life so the thought of trying a role in that area appealed to me, so I think that’s probably why. Would you go back to procurement in the future? Yes quite possibly, before I began the apprenticeship I didn’t really know much about procurement and maybe I couldn’t see myself working in that area. Now having done so and learning what I know now I have thoroughly enjoyed it and I definitely think that it could be an option to go back to in the future. What advice would you give to someone considering an apprenticeship? I think the main pieces of advice I would give are that they are a great way to gain some experience in the work place as well as studying for qualifications which employers would value in the future. I think it’s important to manage your time well and get those assignments handed in and get those exams revised for so that you are successful, even if that means giving up some of your own free time in the evenings and at weekends. I just wanted to take the opportunity to just say a big thank you to the CPC and the college because obviously the support I’ve received has been second to none. I just think that I’ve learnt so much over the past 18 months and the opportunity has allowed me to grow hugely both personally and professionally, I think that’s something in the future that I always will be grateful for. 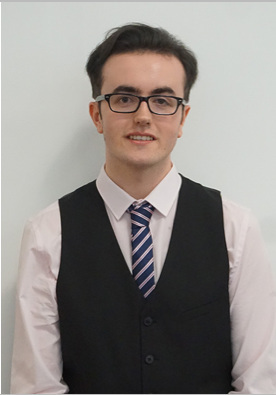 CPC are delighted that Jordan has had such a positive CPC apprenticeship experience with Blackpool Sixth Form College and we wish Jordan all the very best in his future career.